OK – I need to vent. Spring has begun and I find myself (as with the rest of Seattle’s population) thankfully outside. In these neck o’ the woods we have to cram all of the outdoor dog events in a short period of time because the rest of the year is crap. So, it’s that time and the events have started. And the prong collars have come out. You can argue with me all you want “they don’t hurt,” “it’s the only way he won’t pull,” “he has a really thick neck,” “I’m not doing any corrections, he just corrects himself,” “all the Pittie people use them,” “all the Shepherd people use them,” all the fill-in-the-blank people use them…” I have heard it all and I simply don’t agree. Put that thing around your toddler’s neck and see if it “hurts” them and if using a prong collar is the only way your dog will walk nicely on a leash then you haven’t done your homework – yes, you do need to teach your dog. Oh, and same applies for putting shock collar on your dog in order to get a recall. You don’t need it, you need to train your dog to come. Here’s the main reason I don’t want your dog on a prong collar… when your dog passes another dog/person/bike etc. and then gets choked (“corrected”) you have just conditioned your dog that the appearance of that dog/person/bike means pain for them. You have done the exact OPPOSITE of what we try to do with our dogs on leash, especially our reactive dogs. 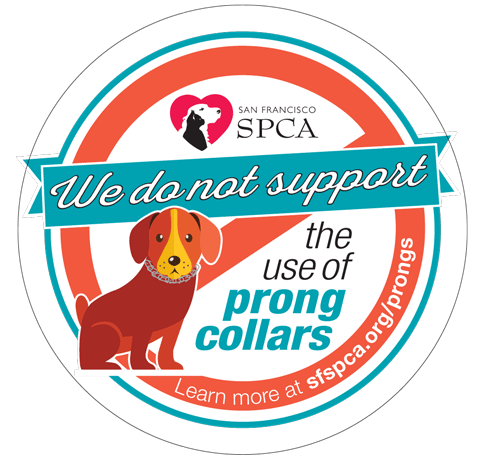 By the way, this happens even on a flat collar around a dog’s neck so, if your dog is pulling at all, put him on a piece of equipment that does not go around his neck. There are plenty of good options (head collars, body harnesses) available. I work with a lot of reactive dogs and what we do is condition them so that the presence of dog/person/bike means GREAT things for them! Dog goes by, chicken falls from the sky! We change (condition) the way that dogs feels about the presence of that stimulus, whatever it may be. As a bonus, now not only does your dog not react, or pull, or walk poorly on the leash but he actually looks to you when dogs/people/bikes pass by. Classical conditioning, it’ a win-win! There is also the issue of punishment (“corrections”) suppressing behavior. Yes, they suppress behavior and I can see how folks may think that is good BUT what punishment does not do is address the CAUSE of the behavior. By just suppressing behavior you can end up with a dog who is completely shut down and scared to behave at all. Maybe some people think that is obedient; personally, I think it is cruel. If you want a puppet to control and “command” then I suppose that will work for you. Not the relationship I want with my dog and I urge you to think about the kind of relationship you want with your dog. There are lots of other problems with using punishment in dog training and unfortunately, I see dogs all the time who have been damaged by the “training” methods used by a training using punishment and aversive equipment that we are now trying to rehabilitate. If you run into a trainer who recommends these devices, RUN away! Here is some good info on choosing a trainer. 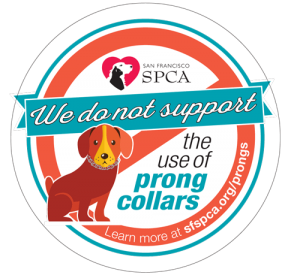 I can certainly come back at you on any of these excuses you want to throw at me for using a prong (or shock, “e”) collar but frankly, that’s just a waste of our time. What I really want is your dog to be joyful, well-behaved and yes, easy for you. It’s really not that hard and you really don’t need that prong collar. Go here for LOOSE LEASH WALKING TIPS and here for my take on LEASH GREETINGS. If you are using an “E” collar for barking try this instead: STOP BARKING! Thank you so much for this post! When we got our reactive dog I had a friend who told us that was our only option. I disagreed and chose to do positive training instead. I wish more people were aware there is a better way to train their dogs. I appreciate you articulating why pinch collars are a bad thing. Thanks! And good for you!